What time it is? Adventure Time! Jazwares decided that we needed a scale in between their 5 inch posable and their 2 inch static figures. I have to agree. Jazwares gives us a slightly articulated figure and a static figure per package plus accessories and stands. Fionna's little feet are so pointy that she needs a clip stand to remain upright. She is packed with the crystal sword "Prince Gumball" gave her. Cake has no articulation and stands up perfectly. The designs are solid (they also seem durable, unlike the early Jazwares Sonic the Hedgehog figures) and they are painted great. These are must have figures for Adventure Time fans. Is it too early to hope for Prince Gumball, Ice Queen, and Marshall Lee? 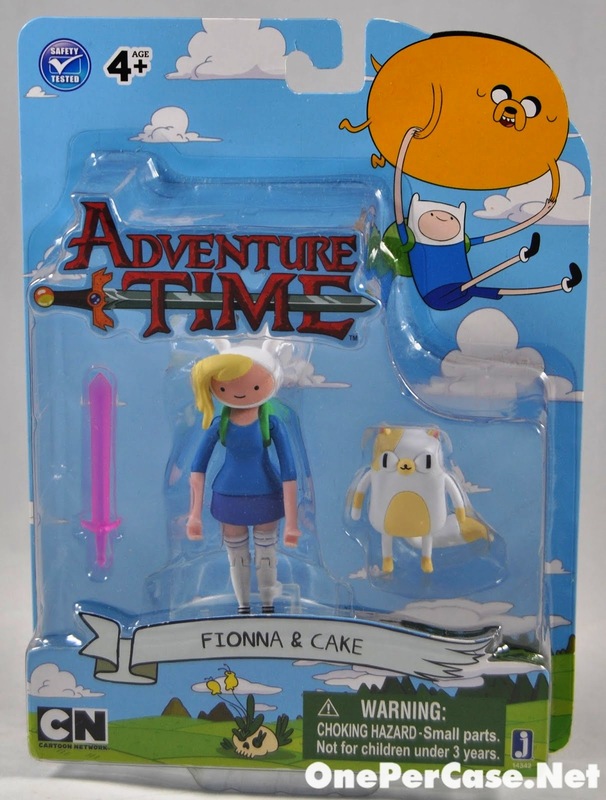 I found these at Toys R Us a few weeks ago and Entertainment Earth has them by the case here: Adventure Time 3 inch figures Unfortunately, Fionna and Cake are packed one per case.